I recently read Dr. Tony Bates’ recent blog post Is the current use of video a step backwards in online learning? and thought I’d take a crack at a response based on some of my observations in the use of video in online learning. Note that this is only the instances that I’ve seen and can recall, no surveys or other tools were used, just off the cuff recall. In his blogpost he describes several uses of video in learning contexts, specifically in universities, so keep that in mind that that’s where my response is coming from as well. I know there are so many ways we could use video to improve learning at polytechs, continuing ed, and workplace learning contexts but that is outside the scope of the post here. Are you seeing video lectures replacing specifically designed asynchronous learning for online delivery? In my experience over the past 6 years, specifically designed materials for async-learning online (including self-paced aspects of blended learning) has overwhelmingly been written or existing media based. Online and blended learning courses make use of a lot of video, but generally speaking those videos exist in video databases that the university has a subscription to, NFB, YouTube, Vimeo, etc. That being said, the courses that do make use of instructor created ‘lecture’ videos almost completely replace any instructor written materials. The courses that I have seen this shift were primarily in MOOCs and blended learning courses – mostly of the ‘flipped classroom’ variety – as opposed to full term, degree credit online courses. There is however a distinction in the types of videos used in a few different settings. For example, I wrote previously about a novel use of video in one course where it was a series of guest interviews instead of lectures. In another course, most of the videos were typical voice over PPT style, but there were some videos which were a bit more novel, making use of animations and more storytelling than bullet point narration. While there are some of these exceptions, generally when I see instructor made video in a course it is a narrated PPT which I think it what Tony is referring to in his post. I do not see lecture videos replacing other specifically design videos that are used in online courses, only as a replacement for instructor written content. Is this a good thing, in that it is encouraging instructors to teach online who would not otherwise do so? I can’t think of a single instance where an instructor I’ve worked with, who was interested in teaching F2F or in blended environments only, suddenly became interested in teaching online because they were introduced to the idea of video lectures. 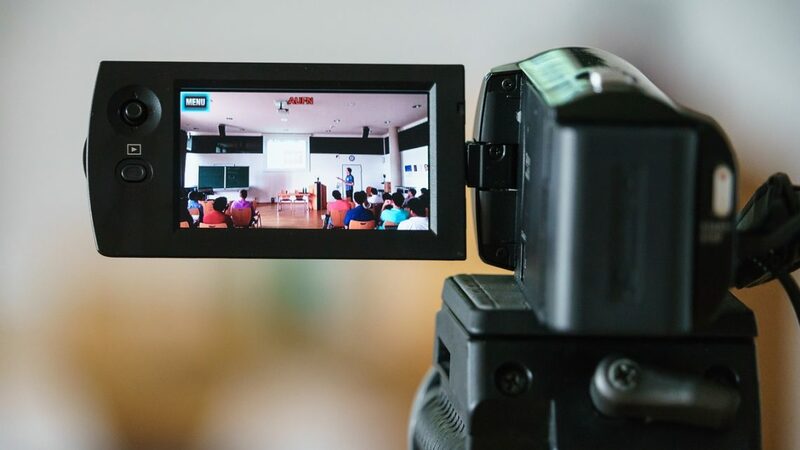 There have been a few cases where, when shown how video can be used in online courses, that instructors strive to include at least a few in their course. Occasionally, I’ve met instructors who maybe haven’t taught online before, or have taught a few online courses, who took a MOOC or two and then understood that to be what online learning looks like. That either works as a nice starting place or a hurdle to overcome depending on the context of the course in discussion. Without any hard data on every single course I’ve consulted on, my sense is that instructors that teach online, who develop their course from scratch, are generally attracted to video lecture because it appears to be the shortest leap from F2F to online, “I already have PPTs so why don’t I just record that and throw it online”. Based on the number of LMS, Learning Platforms, etc. presentations I’ve seen over the years where the presenter shows ‘putting your course online’ by dragging a handful of PPTs onto a web browser and calling it done, I would say we have a lot of advocacy work to do as Ed Techs/IDs/etc. Are you seeing any differences in outcomes as a result? Are students learning more or less of the same, or are they learning something different? Is synchronous discussion inherently superior to asynchronous discussion? Is spoken discussion better than written discussion? I would say no outright. Only because Tony threw in “inherently”. I’m sure we’ve all been in a classroom, webinar, or other discussion space where the facilitation just killed any potential for it to be interesting. It’s also interesting to consider what different instructors consider discussion. For example, I’ve met a number of instructors that balk at the notion of online learning because their classroom is very ‘interactive’ and discussion based. When I observe those classes what I observe is mostly direct questioning with one or two responses before the lecture resumes. No discussion. No debate. No emergent elements. I think there are elements of spoken discussion which, especially in a synchronous setting, can make a discussion feel more alive than written. For example, in your web-conference you can hop on the microphone or type in the chat box. Generally, if you jump on the microphone you can get your ideas out a bit quicker and with inflection. If the learners/audience is stuck with only the chat box there’s often that dead space after the presenter asks a question while everyone is typing furiously. Even if it lasts only for 10-15 seconds it feels slow and painful at times. The tool itself makes it awkward to manage the written discussion as well because most web-conferecing software prioritizes video or slidedecks and not the chat function. Where’s the research on this? Or don’t we need it? We need it certainly. Mayer’s work on instructional media is a good starting place (considering he has 500+ publications in the area). If you like digestible reading for this then Patti Shank has a short overview at elearning industry. An interesting set of research I bumped into last week was Easier Seen Than Done: Merely Watching Others Perform Can Foster an Illusion of Skill Acquisition (paywall). What was interesting about this was that when participants watched instructional videos, their sense of confidence in being able to perform the task increased the more they watched the video. This lead to a false sense of confidence and the participants found it more difficult than they thought when actually trying to perform the task. Now here’s something that was surprising. This effect of consuming instructional media leading to a false sense of proficiency was most prevalent with the video treatments. People who watched video fell into this trap faster than people who would read the instructions. That is a very relevant and interesting finding for those using video in learning contexts. The other part of the research about having the participant try the task or at least interact with the objects of the task a bit leading to better outcomes is a bit of a, “of course” moment if you have any learning theory background.